Printed stickers are an easy, cost-effective, and eye catching way of promoting your brand, or for use as safety signage. One of the leading names in printed stickers is SignFX. We are based in Naas, County Kildare, which is only next door to County Dublin. With Dublin being the capital of the Republic of Ireland, a lot of demand for printed stickers come from our capital city. These stickers enable you to advertise your business in a way that best suits your needs. The beauty of using printed stickers and labels is the fact you can expose your brand across almost any channels. They stick to almost anything you apply them to, from windows to vans. There is scope for bespoke designs and messages which project the right image for your company. 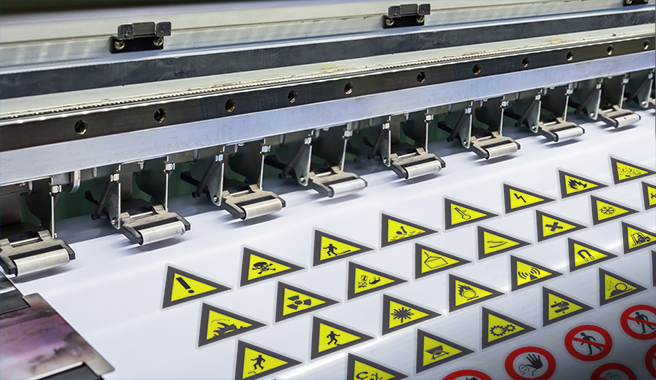 We provide custom printed stickers and labels in all shapes and sizes that are suitable for all sectors. These can range from vinyl stickers for advertising on commercial vehicles or for the standard hazard symbol stickers you see in hazardous environments. So long as the surface is clean and smooth vinyl stickers will stick nearly any place. Lex edge is a clear scratch resistant material. The print applied to the rear of the material before the adhesive is applied. They are ideal for areas which, for example, are cleaned on a regular basis. These include superstores, industrial warehouses, and hospitals. As well as providing printed stickers, we also provide a wall plaque engraving service, using the latest machinery and tools we can get the wall plaque which perfectly represents your business. If you have any questions or would like a quote on your custom sticker and label order, then get in touch today on 045 880603 or you can reach us via email on info@signfx.ie and a member of our experienced team will be on hand to assist.